Juniors Kaitana Martinez and Haylee Thompson and the rest of the Wood River Wolverines just wore down two opponents in 66-39 and 60-39 home girls' basketball victories over Canyon Ridge of Twin Falls and Buhl last week in Hailey. Martinez (24.8 ppg) quietly scored career-high totals of 27 and 32 points while 6-1 forward Thompson came alive with 14 second-half points and a game-high 14 rebounds in Saturday's 21-point win over Buhl. Until Thompson started her roll, Wood River was locked in a one-point game with the Tribe. Now, unbeaten Wood River (5-0, 1-0 league) is setting out in earnest on its Great Basin Conference schedule. The Wolverines travel to Burley (2-5, 1-0) today, Wednesday, knowing the Bobcats upset Jerome 50-46 Friday and snapped the 40-game Tiger home win streak. Having improved its two-year homecourt record to 15-1, Wood River will host the Minico Spartans (2-4) Friday, Dec. 10 in another important Great Basin contest, then travel to Kimberly, Jerome and Hillcrest the week of Dec. 14-18. 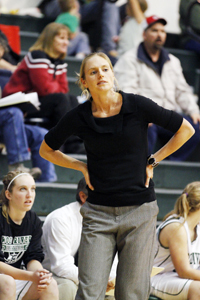 Wood River coach Mendy Benson said she has seen some encouraging signs from her unbeaten squad, particularly the play of Martinez and the ability of the Wolverines to start their games more effectively on offense this year. With her 32-point effort against Buhl Saturday, Martinez came within three points of tying the school single-game scoring record of 35 points. And she is climbing rapidly on the career scoring list, on the verge of becoming the #2 all-time scorer by the end of the current campaign. Benson said about Martinez, "She has truly raised the level of her game so far. She put in a lot of work over the summer and expanded her horizons by playing with a club team in Boise so she could get different competition. It's making all the difference in the world." Fast starts are also benefiting Wood River. Two years ago in Benson's first coaching season at Wood River, the 5-16 Wolverines averaged 6.3 points in the first quarters of their games. Last year's 17-7 squad averaged 9.1. This year it's 12.8. Thursday against Canyon Ridge, Martinez picked apart the Riverhawks with 14 points in the 22-point Wolverine first quarter that set the tone for the 27-point league blowout. It was the most Wood River has ever scored in a quarter for coach Benson, exceeded only by Saturday's 23-point fourth quarter that held off pesky Buhl. Benson said, "As far as starting off games stronger, the girls are maturing under my system. Philosophically we're doing things pretty close to the last two years, but we're just doing them a little better and fine-tuning the details. It helps that my varsity team makes a huge commitment to attending summer camp and shooting camps and tournaments. "We made almost a season's progress last summer." Martinez's consistency has been the foundation of an offense that in the early going has improved by 14 points per game over last year's attack. Against Canyon Ridge and Buhl, her successive point totals by quarter were 14, 2, 4, 7, 7, 8, 8 and 9. The 5-6 guard had two-game totals of six rebounds, 12 steals and 12 assists, coming close to a triple-double against Canyon Ridge with 27 points, eight steals and eight assists. She buried four 3-pointers over the two games. The Riverhawks defenders were no match for Martinez's quickness and athleticism—and Wood River put seven players into the scoring column on a 66-point night that was only two buckets away from the school's all-time single-game scoring mark of 71 points. Contributors were Haylee Thompson (11 points, 6 boards, 3 steals), Haillie Taylor (7 points, 4 boards, 5 assists), Taylor Hayes (7 points, 2 rebounds, 2 steals, 3 assists), Cheyenne Swanson (6 points, 3 steals), Allie Hesteness (4 points, 3 rebounds, 4 steals) and Hunter Thompson (4 points, 2 boards). Wood River's defense made 20 steals and Canyon Ridge (3-3, 0-1) committed 24 turnovers. Junior post Breyana Burk (6 points, 10 boards) and Karly Hudelson (11 points, 5 steals) led the 'Hawks for the evening. Against Buhl, cold-shooting Wood River had a much slower start and missed easy shots. But the Wolverines slipped ahead of the upset-minded Tribe (0-5) by a 18-17 score at half mainly due to 15 points by Martinez and strong defensive work by Swanson (5 rebounds and 5 steals in the first half). The sluggish Wolverine start continued into the third quarter, Buhl taking its biggest lead at 22-18. But Wood River threw a fullcourt press at the Tribe and kept trying to hammer the ball down low to Thompson, who was frustrated by missing a series of close-in attempts. Finally, Thompson converted a putback. And coach Benson hollered at the team for flubbing a sure-fire fast break—a pep talk that paid dividends for the rest of the Saturday matinee. Wood River finished the third with a 14-8 run for a 37-30 lead—Thompson dominating with eight points and seven boards in the third period. The fourth period was all Wood River, indeed, the home team went on a 35-14 run after Benson's time-out pep talk. Buhl (26 turnovers) did the best it could but never solved Wood River's switching defenses and 23-11 second-half board edge. Martinez's numbers were 32 points, 10-for-14 from the free throw line, two 3-pointers, 3 rebounds, 4 steals and 4 assists. Other contributors were Taylor Hayes (4 points, 3 steals, one 3-pointer), Haillie Taylor (4 points, 3 boards, 3 assists), Cookie Benson (2 points), Jade Glenn (2 points), Swanson (2 points, 10 rebounds, 6 steals) and Allie Hesteness (4 boards). Buhl's leaders were junior Kendyl Hamilton (8 points, 4 boards, 4 steals), junior point guard Cassidee Kippes (8 points, 2 assists), junior Morgan Pearson (7 points, 5 rebounds), senior Katherine Hunter (5 points, 4 rebounds, 2 assists) and sophomore Kali Archibald (6 points). Other GBC games today, Wednesday are Jerome (4-2, 0-1) hosting unbeaten Twin Falls (6-0) and Minico at Canyon Ridge. The Wood River High School boys' varsity basketball team played without junior Stone Sutton in Friday's 49-21 road loss to the Filer Wildcats. Sutton didn't suit up or travel because of a death in his family. Scoring for Wood River (0-2) in the loss were Kevin Jensen (7 points), Dylan Carey (6), Alex Padilla (3), Jake Vegwert (3) and Quentin Dowdle (2). The Wolverine boys have two home games this week starting with Tuesday's home non-conference match-up with Mountain Home. Buhl's Tribe (1-1) arrives Thursday, Dec. 9 and Wood River travels to Idaho Falls for a 3:30 p.m. Saturday matinee with Hillcrest.